Chakra flags come in five and ten foot strands. They consist of the seven chakras symbolizing stability, balance, energy, compassion, communication, intuition, and receiving. 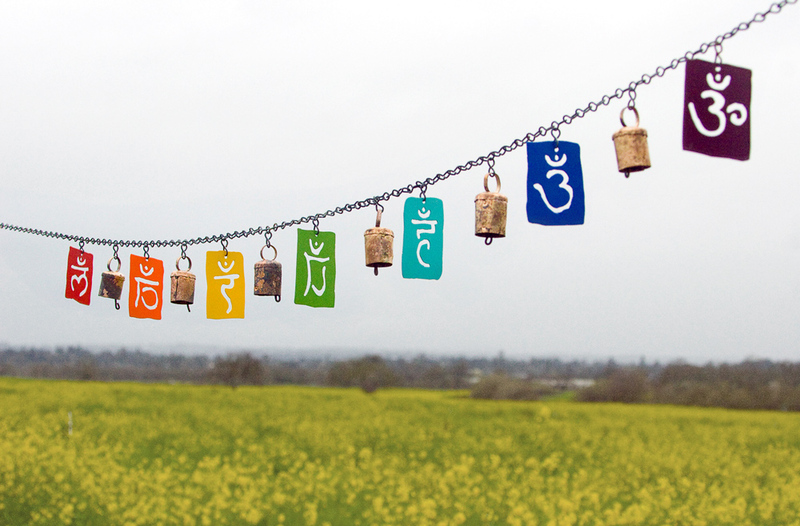 The bells are purchased from a sustainable company in India, and are said to promote positive energy. Walk in with Love. These flags to hang over your doorway ringing love to all that pass under. We create our reality, sound creates form, and we are the creators of our life. 5 foot strands. Metal pieces are approximately 2"x2.5" and the bells are 2" tall. 10 foot strands with the same bells and chain as the small flags. Metal pieces are approximately 4"x4". 10 foot strands with large chain and bells. Metal pieces are approximately 4"x4" and the bells are 4" tall.